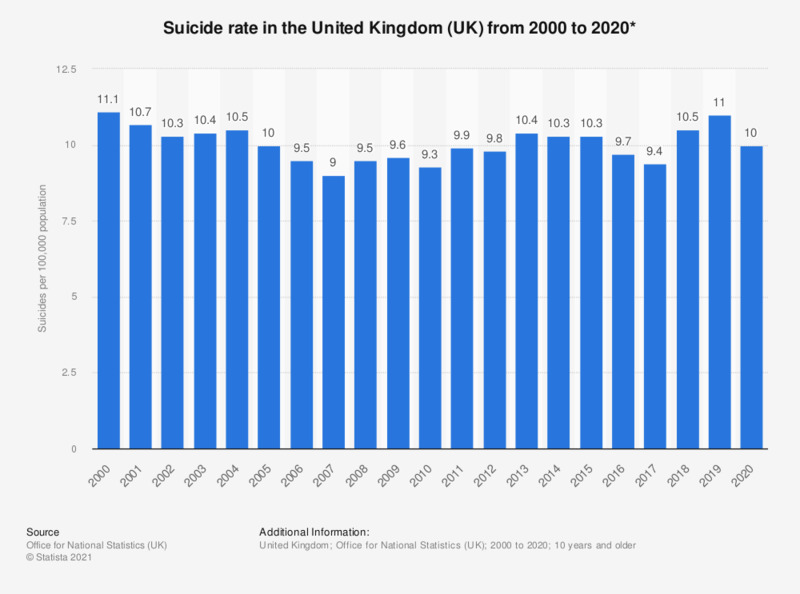 This statistic shows the suicide rate in the United Kingdom (UK) from 2000 to 2017. The suicide rate is the amount of suicides per 100,000 population over 10 years old. The rate of suicide in 2017 was 10.1 deaths per 100,000 population, a slight decline from the previous year. * In the United Kingdom, suicide is defined as deaths given an underlying cause of intentional self-harm or injury/poisoning of undetermined intent. In 2016 the definition of suicide has been modified to include deaths from intentional self-harm in 10-14 year old children in addition to deaths from intentional self-harm and events of undetermined intent in people aged 15 and over. Data from previous years has been revised to reflect this change.